Two United States Navy sailors prepare for training inside a decompression chamber. Not to be confused with Decompression (diving). Decompression sickness (DCS; also known as divers' disease, the bends, aerobullosis, or caisson disease) describes a condition arising from dissolved gases coming out of solution into bubbles inside the body on depressurisation. DCS most commonly refers to problems arising from underwater diving decompression (i.e., during ascent), but may be experienced in other depressurisation events such as emerging from a caisson, flying in an unpressurised aircraft at altitude, and extravehicular activity from spacecraft. DCS and arterial gas embolism are collectively referred to as decompression illness. Since bubbles can form in or migrate to any part of the body, DCS can produce many symptoms, and its effects may vary from joint pain and rashes to paralysis and death. Individual susceptibility can vary from day to day, and different individuals under the same conditions may be affected differently or not at all. The classification of types of DCS by its symptoms has evolved since its original description over a hundred years ago. Risk of DCS caused by diving can be managed through proper decompression procedures and contracting it is now uncommon. Its potential severity has driven much research to prevent it and divers almost universally use dive tables or dive computers to limit their exposure and to control their ascent speed. If DCS is suspected, it is treated by hyperbaric oxygen therapy in a recompression chamber. If treated early, there is a significantly higher chance of successful recovery. DCS is classified by symptoms. The earliest descriptions of DCS used the terms: "bends" for joint or skeletal pain; "chokes" for breathing problems; and "staggers" for neurological problems. In 1960, Golding et al. introduced a simpler classification using the term "Type I ('simple')" for symptoms involving only the skin, musculoskeletal system, or lymphatic system, and "Type II ('serious')" for symptoms where other organs (such as the central nervous system) are involved. Type II DCS is considered more serious and usually has worse outcomes. This system, with minor modifications, may still be used today. Following changes to treatment methods, this classification is now much less useful in diagnosis, since neurological symptoms may develop after the initial presentation, and both Type I and Type II DCS have the same initial management. The term dysbarism encompasses decompression sickness, arterial gas embolism, and barotrauma, whereas decompression sickness and arterial gas embolism are commonly classified together as decompression illness when a precise diagnosis cannot be made. DCS and arterial gas embolism are treated very similarly because they are both the result of gas bubbles in the body. The U.S. Navy prescribes identical treatment for Type II DCS and arterial gas embolism. Their spectra of symptoms also overlap, although the symptoms from arterial gas embolism are generally more severe because they often arise from an infarction (blockage of blood supply and tissue death). While bubbles can form anywhere in the body, DCS is most frequently observed in the shoulders, elbows, knees, and ankles. Joint pain ("the bends") accounts for about 60% to 70% of all altitude DCS cases, with the shoulder being the most common site. Neurological symptoms are present in 10% to 15% of DCS cases with headache and visual disturbances being the most common symptom. Skin manifestations are present in about 10% to 15% of cases. Pulmonary DCS ("the chokes") is very rare in divers and has been observed much less frequently in aviators since the introduction of oxygen pre-breathing protocols. The table below shows symptoms for different DCS types. Localized deep pain, ranging from mild to excruciating. Sometimes a dull ache, but rarely a sharp pain. Active and passive motion of the joint aggravates the pain. The pain may be reduced by bending the joint to find a more comfortable position. If caused by altitude, pain can occur immediately or up to many hours later. Although onset of DCS can occur rapidly after a dive, in more than half of all cases symptoms do not begin to appear for at least an hour. In extreme cases, symptoms may occur before the dive has been completed. The U.S. Navy and Technical Diving International, a leading technical diver training organization, have published a table that documents time to onset of first symptoms. The table does not differentiate between types of DCS, or types of symptom. DCS is caused by a reduction in ambient pressure that results in the formation of bubbles of inert gases within tissues of the body. It may happen when leaving a high-pressure environment, ascending from depth, or ascending to altitude. DCS is best known as a diving disorder that affects divers having breathed gas that is at a higher pressure than the surface pressure, owing to the pressure of the surrounding water. The risk of DCS increases when diving for extended periods or at greater depth, without ascending gradually and making the decompression stops needed to slowly reduce the excess pressure of inert gases dissolved in the body. The specific risk factors are not well understood and some divers may be more susceptible than others under identical conditions. DCS has been confirmed in rare cases of breath-holding divers who have made a sequence of many deep dives with short surface intervals; and it may be the cause of the disease called taravana by South Pacific island natives who for centuries have dived by breath-holding for food and pearls. the rate and duration of outgassing on depressurization – the faster the ascent and the shorter the interval between dives the less time there is for absorbed gas to be offloaded safely through the lungs, causing these gases to come out of solution and form "micro bubbles" in the blood. Even when the change in pressure causes no immediate symptoms, rapid pressure change can cause permanent bone injury called dysbaric osteonecrosis (DON). DON can develop from a single exposure to rapid decompression. When workers leave a pressurized caisson or a mine that has been pressurized to keep water out, they will experience a significant reduction in ambient pressure. A similar pressure reduction occurs when astronauts exit a space vehicle to perform a space-walk or extra-vehicular activity, where the pressure in their spacesuit is lower than the pressure in the vehicle. The original name for DCS was "caisson disease". This term was introduced in the 19th century, when caissons under pressure were used to keep water from flooding large engineering excavations below the water table, such as bridge supports and tunnels. Workers spending time in high ambient pressure conditions are at risk when they return to the lower pressure outside the caisson if the pressure is not reduced slowly. DCS was a major factor during construction of Eads Bridge, when 15 workers died from what was then a mysterious illness, and later during construction of the Brooklyn Bridge, where it incapacitated the project leader Washington Roebling. On the other side of the Manhattan island during construction of the Hudson River Tunnel contractor's agent Ernest William Moir noted in 1889 that workers were dying due to decompression sickness and pioneered the use of an airlock chamber for treatment. The most common health risk on ascent to altitude is not decompression sickness but altitude sickness, or acute mountain sickness (AMS), which has an entirely different and unrelated set of causes and symptoms. AMS results not from the formation of bubbles from dissolved gasses in the body but from exposure to a low partial pressure of oxygen and alkalosis. However, passengers in unpressurized aircraft at high altitude may also be at some risk of DCS. Altitude DCS became a problem in the 1930s with the development of high-altitude balloon and aircraft flights but not as great a problem as AMS, which drove the development of pressurized cabins, which coincidentally controlled DCS. Commercial aircraft are now required to maintain the cabin at or below a pressure altitude of 2,400 m (7,900 ft) even when flying above 12,000 m (39,000 ft). Symptoms of DCS in healthy individuals are subsequently very rare unless there is a loss of pressurization or the individual has been diving recently. Divers who drive up a mountain or fly shortly after diving are at particular risk even in a pressurized aircraft because the regulatory cabin altitude of 2,400 m (7,900 ft) represents only 73% of sea level pressure. Generally, the higher the altitude the greater the risk of altitude DCS but there is no specific, maximum, safe altitude below which it never occurs. There are very few symptoms at or below 5,500 m (18,000 ft) unless patients had predisposing medical conditions or had dived recently. There is a correlation between increased altitudes above 5,500 m (18,000 ft) and the frequency of altitude DCS but there is no direct relationship with the severity of the various types of DCS. A US Air Force study reports that there are few occurrences between 5,500 m (18,000 ft) and 7,500 m (24,600 ft) and 87% of incidents occurred at or above 7,500 m (24,600 ft). High altitude parachutists may reduce the risk of altitude DCS if they flush nitrogen from the body by pre-breathing pure oxygen. Although the occurrence of DCS is not easily predictable, many predisposing factors are known. They may be considered as either environmental or individual. Decompression sickness and arterial gas embolism in recreational diving are associated with certain demographic, environmental, and dive style factors. A statistical study published in 2005 tested potential risk factors: age, gender, body mass index, smoking, asthma, diabetes, cardiovascular disease, previous decompression illness, years since certification, dives in the last year, number of diving days, number of dives in a repetitive series, last dive depth, nitrox use, and drysuit use. No significant associations with risk of decompression sickness or arterial gas embolism were found for asthma, diabetes, cardiovascular disease, smoking, or body mass index. Increased depth, previous DCI, larger number of consecutive days diving, and being male were associated with higher risk for decompression sickness and arterial gas embolism. Nitrox and drysuit use, greater frequency of diving in the past year, increasing age, and years since certification were associated with lower risk, possibly as indicators of more extensive training and experience. the magnitude of the pressure reduction ratio – a large pressure reduction ratio is more likely to cause DCS than a small one. repetitive exposures – repetitive dives within a short period of time (a few hours) increase the risk of developing DCS. Repetitive ascents to altitudes above 5,500 metres (18,000 ft) within similar short periods increase the risk of developing altitude DCS. the rate of ascent – the faster the ascent the greater the risk of developing DCS. The US Navy Dive Manual indicates that ascent rates greater than about 20 m/min (66 ft/min) when diving increase the chance of DCS, while recreational dive tables such as the Bühlmann tables require an ascent rate of 10 m/min (33 ft/min) with the last 6 m (20 ft) taking at least one minute. An individual exposed to a rapid decompression (high rate of ascent) above 5,500 metres (18,000 ft) has a greater risk of altitude DCS than being exposed to the same altitude but at a lower rate of ascent. the duration of exposure – the longer the duration of the dive, the greater is the risk of DCS. Longer flights, especially to altitudes of 5,500 m (18,000 ft) and above, carry a greater risk of altitude DCS. underwater diving before flying – divers who ascend to altitude soon after a dive increase their risk of developing DCS even if the dive itself was within the dive table safe limits. Dive tables make provisions for post-dive time at surface level before flying to allow any residual excess nitrogen to outgas. However, the pressure maintained inside even a pressurized aircraft may be as low as the pressure equivalent to an altitude of 2,400 m (7,900 ft) above sea level. Therefore, the assumption that the dive table surface interval occurs at normal atmospheric pressure is invalidated by flying during that surface interval, and an otherwise-safe dive may then exceed the dive table limits. diving before travelling to altitude – DCS can occur without flying if the person moves to a high-altitude location on land immediately after diving, for example, scuba divers in Eritrea who drive from the coast to the Asmara plateau at 2,400 m (7,900 ft) increase their risk of DCS. diving at altitude – diving in water whose surface altitude is above 300 m (980 ft) — for example, Lake Titicaca is at 3,800 m (12,500 ft) — without using versions of decompression tables or dive computers that are modified for high-altitude. Atrial septal defect (PFO) showing left-to-right shunt. A right-to-left shunt may allow bubbles to pass into the arterial circulation. dehydration – Studies by Walder concluded that decompression sickness could be reduced in aviators when the serum surface tension was raised by drinking isotonic saline, and the high surface tension of water is generally regarded as helpful in controlling bubble size. Maintaining proper hydration is recommended. 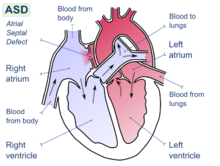 patent foramen ovale – a hole between the atrial chambers of the heart in the fetus is normally closed by a flap with the first breaths at birth. In about 20% of adults the flap does not completely seal, however, allowing blood through the hole when coughing or during activities that raise chest pressure. In diving, this can allow venous blood with microbubbles of inert gas to bypass the lungs, where the bubbles would otherwise be filtered out by the lung capillary system, and return directly to the arterial system (including arteries to the brain, spinal cord and heart). In the arterial system, bubbles (arterial gas embolism) are far more dangerous because they block circulation and cause infarction (tissue death, due to local loss of blood flow). In the brain, infarction results in stroke, and in the spinal cord it may result in paralysis. a person's age – there are some reports indicating a higher risk of altitude DCS with increasing age. previous injury – there is some indication that recent joint or limb injuries may predispose individuals to developing decompression-related bubbles. ambient temperature – there is some evidence suggesting that individual exposure to very cold ambient temperatures may increase the risk of altitude DCS. Decompression sickness risk can be reduced by increased ambient temperature during decompression following dives in cold water. body type – typically, a person who has a high body fat content is at greater risk of DCS. This is due to nitrogen's five times greater solubility in fat than in water, leading to greater amounts of total body dissolved nitrogen during time at pressure. Fat represents about 15–25 percent of a healthy adult's body, but stores about half of the total amount of nitrogen (about 1 litre) at normal pressures. alcohol consumption – although alcohol consumption increases dehydration and therefore may increase susceptibility to DCS, a 2005 study found no evidence that alcohol consumption increases the incidence of DCS. This surfacing diver must enter a decompression chamber for surface decompression, a standard operating procedure to avoid decompression sickness after long or deep bounce dives. Depressurisation causes inert gases, which were dissolved under higher pressure, to come out of physical solution and form gas bubbles within the body. These bubbles produce the symptoms of decompression sickness. Bubbles may form whenever the body experiences a reduction in pressure, but not all bubbles result in DCS. The amount of gas dissolved in a liquid is described by Henry's Law, which indicates that when the pressure of a gas in contact with a liquid is decreased, the amount of that gas dissolved in the liquid will also decrease proportionately. 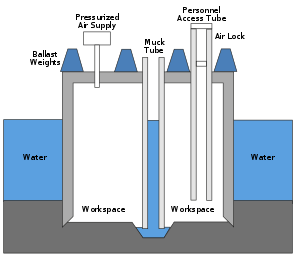 On ascent from a dive, inert gas comes out of solution in a process called "outgassing" or "offgassing". Under normal conditions, most offgassing occurs by gas exchange in the lungs. If inert gas comes out of solution too quickly to allow outgassing in the lungs then bubbles may form in the blood or within the solid tissues of the body. The formation of bubbles in the skin or joints results in milder symptoms, while large numbers of bubbles in the venous blood can cause lung damage. The most severe types of DCS interrupt — and ultimately damage — spinal cord function, leading to paralysis, sensory dysfunction, or death. In the presence of a right-to-left shunt of the heart, such as a patent foramen ovale, venous bubbles may enter the arterial system, resulting in an arterial gas embolism. A similar effect, known as ebullism, may occur during explosive decompression, when water vapour forms bubbles in body fluids due to a dramatic reduction in environmental pressure. The main inert gas in air is nitrogen, but nitrogen is not the only gas that can cause DCS. Breathing gas mixtures such as trimix and heliox include helium, which can also cause decompression sickness. Helium both enters and leaves the body faster than nitrogen, so different decompression schedules are required, but, since helium does not cause narcosis, it is preferred over nitrogen in gas mixtures for deep diving. There is some debate as to the decompression requirements for helium during short-duration dives. Most divers do longer decompressions; however, some groups like the WKPP have been pioneering the use of shorter decompression times by including deep stops. Any inert gas that is breathed under pressure can form bubbles when the ambient pressure decreases. Very deep dives have been made using hydrogen-oxygen mixtures (hydrox), but controlled decompression is still required to avoid DCS. DCS can also be caused at a constant ambient pressure when switching between gas mixtures containing different proportions of inert gas. This is known as isobaric counterdiffusion, and presents a problem for very deep dives. For example, after using a very helium-rich trimix at the deepest part of the dive, a diver will switch to mixtures containing progressively less helium and more oxygen and nitrogen during the ascent. Nitrogen diffuses into tissues 2.65 times slower than helium, but is about 4.5 times more soluble. Switching between gas mixtures that have very different fractions of nitrogen and helium can result in "fast" tissues (those tissues that have a good blood supply) actually increasing their total inert gas loading. This is often found to provoke inner ear decompression sickness, as the ear seems particularly sensitive to this effect. The location of micronuclei or where bubbles initially form is not known. The most likely mechanisms for bubble formation are tribonucleation, when two surfaces make and break contact (such as in joints), and heterogeneous nucleation, where bubbles are created at a site based on a surface in contact with the liquid. Homogeneous nucleation, where bubbles form within the liquid itself is less likely because it requires much greater pressure differences than experienced in decompression. The spontaneous formation of nanobubbles on hydrophobic surfaces is a possible source of micronuclei, but it is not yet clear if these can grow large enough to cause symptoms as they are very stable. Once microbubbles have formed, they can grow by either a reduction in pressure or by diffusion of gas into the gas from its surroundings. In the body, bubbles may be located within tissues or carried along with the bloodstream. The speed of blood flow within a blood vessel and the rate of delivery of blood to capillaries (perfusion) are the main factors that determine whether dissolved gas is taken up by tissue bubbles or circulation bubbles for bubble growth. The primary provoking agent in decompression sickness is bubble formation from excess dissolved gases. Various hypotheses have been put forward for the nucleation and growth of bubbles in tissues, and for the level of supersaturation which will support bubble growth. The earliest bubble formation detected is subclinical intravascular bubbles detectable by doppler ultrasound in the venous systemic circulation. The presence of these "silent" bubbles is no guarantee that they will persist and grow to be symptomatic. Vascular bubbles formed in the systemic capillaries may be trapped in the lung capillaries, temporarily blocking them. If this is severe, the symptom called "chokes" may occur. If the diver has a patent foramen ovale (or a shunt in the pulmonary circulation), bubbles may pass through it and bypass the pulmonary circulation to enter the arterial blood. If these bubbles are not absorbed in the arterial plasma and lodge in systemic capillaries they will block the flow of oxygenated blood to the tissues supplied by those capillaries, and those tissues will be starved of oxygen. Moon and Kisslo (1988) concluded that "the evidence suggests that the risk of serious neurological DCI or early onset DCI is increased in divers with a resting right-to-left shunt through a PFO. There is, at present, no evidence that PFO is related to mild or late onset bends." Bubbles form within other tissues as well as the blood vessels. Inert gas can diffuse into bubble nuclei between tissues. In this case, the bubbles can distort and permanently damage the tissue. As they grow, the bubbles may also compress nerves, causing pain.Extravascular or autochthonous[a] bubbles usually form in slow tissues such as joints, tendons and muscle sheaths. Direct expansion causes tissue damage, with the release of histamines and their associated affects. Biochemical damage may be as important as, or more important than mechanical effects. Bubble size and growth may be affected by several factors - gas exchange with adjacent tissues, the presence of surfactants, coalescence and disintegration by collision. Vascular bubbles may cause direct blockage, aggregate platelets and red blood cells, and trigger the coagulation process, causing local and downstream clotting. Arteries may be blocked by intravascular fat aggregation. Platelets accumulate in the vicinity of bubbles. Endothelial damage may be a mechanical effect of bubble pressure on the vessel walls, a toxic effect of stabilised platelet aggregates and possibly toxic effects due to the association of lipids with the air bubbles. Protein molecules may be denatured by reorientation of the secondary and tertiary structure when non-polar groups protrude into the bubble gas and hydrophilic groups remain in the surrounding blood, which may generate a cascade of pathophysiological events with consequent production of clinical signs of decompression sickness. The physiological effects of a reduction in environmental pressure depend on the rate of bubble growth, the site, and surface activity. A sudden release of sufficient pressure in saturated tissue results in a complete disruption of cellular organelles, while a more gradual reduction in pressure may allow accumulation of a smaller number of larger bubbles, some of which may not produce clinical signs, but still cause physiological effects typical of a blood/gas interface and mechanical effects. Gas is dissolved in all tissues, but decompression sickness is only clinically recognised in the central nervous system, bone, ears, teeth, skin and lungs. Necrosis has frequently been reported in the lower cervical, thoracic, and upper lumbar regions of the spinal cord. A catastrophic pressure reduction from saturation produces explosive mechanical disruption of cells by local effervescence, while a more gradual pressure loss tends to produce discrete bubbles accumulated in the white matter, surrounded by a protein layer. Typical acute spinal decompression injury occurs in the columns of white matter. Infarcts are characterised by a region of oedema, haemorrhage and early myelin degeneration, and are typically centred on small blood vessels. The lesions are generally discrete. Oedema usually extends to the adjacent grey matter. Microthrombi are found in the blood vessels associated with the infarcts. Following the acute changes there is an invasion of lipid phagocytes and degeneration of adjacent neural fibres with vascular hyperplasia at the edges of the infarcts. The lipid phagocytes are later replaced by a cellular reaction of astrocytes. Vessels in surrounding areas remain patent but are collagenised. Distribution of spinal cord lesions may be related to vascular supply. There is still uncertainty regarding the aetiology of decompression sickness damage to the spinal cord. Dysbaric osteonecrosis lesions are typically bilateral and usually occur at both ends of the femur and at the proximal end of the humerus Symptoms are usually only present when a joint surface is involved, which typically does not occur until a long time after the causative exposure to a hyperbaric environment. The initial damage is attributed to the formation of bubbles, and one episode can be sufficient, however incidence is sporadic and generally associated with relatively long periods of hyperbaric exposure and aetiology is uncertain. Early identification of lesions by radiography is not possible, but over time areas of radiographic opacity develop in association with the damaged bone. Decompression sickness should be suspected if any of the symptoms associated with the condition occurs following a drop in pressure, in particular, within 24 hours of diving. In 1995, 95% of all cases reported to Divers Alert Network had shown symptoms within 24 hours. An alternative diagnosis should be suspected if severe symptoms begin more than six hours following decompression without an altitude exposure or if any symptom occurs more than 24 hours after surfacing. The diagnosis is confirmed if the symptoms are relieved by recompression. Although MRI or CT can frequently identify bubbles in DCS, they are not as good at determining the diagnosis as a proper history of the event and description of the symptoms. 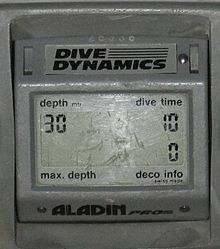 The display of a basic personal dive computer shows depth, dive time, and decompression information. The decompression schedule may be derived from decompression tables, decompression software, or from dive computers, and these are commonly based upon a mathematical model of the body's uptake and release of inert gas as pressure changes. These models, such as the Bühlmann decompression algorithm, are designed to fit empirical data and provide a decompression schedule for a given depth and dive duration. Since divers on the surface after a dive still have excess inert gas in their bodies, decompression from any subsequent dive before this excess is fully eliminated needs to modify the schedule to take account of the residual gas load from the previous dive. This will result in a shorter allowable time under water without obligatory decompression stops, or an increased decompression time during the subsequent dive. The total elimination of excess gas may take many hours, and tables will indicate the time at normal pressures that is required, which may be up to 18 hours. Decompression time can be significantly shortened by breathing mixtures containing much less inert gas during the decompression phase of the dive (or pure oxygen at stops in 6 metres (20 ft) of water or less). The reason is that the inert gas outgases at a rate proportional to the difference between the partial pressure of inert gas in the diver's body and its partial pressure in the breathing gas; whereas the likelihood of bubble formation depends on the difference between the inert gas partial pressure in the diver's body and the ambient pressure. Reduction in decompression requirements can also be gained by breathing a nitrox mix during the dive, since less nitrogen will be taken into the body than during the same dive done on air. Following a decompression schedule does not completely protect against DCS. The algorithms used are designed to reduce the probability of DCS to a very low level, but do not reduce it to zero. One of the most significant breakthroughs in the prevention of altitude DCS is oxygen pre-breathing. Breathing pure oxygen significantly reduces the nitrogen loads in body tissues by reducing the partial pressure of nitrogen in the lungs, which induces diffusion of nitrogen from the blood into the breathing gas, and this effect eventually lowers the concentration of nitrogen in the other tissues of the body. If continued for long enough, and without interruption, this provides effective protection upon exposure to low-barometric pressure environments. However, breathing pure oxygen during flight alone (ascent, en route, descent) does not decrease the risk of altitude DCS as the time required for ascent is generally not sufficient to significantly desaturate the slower tissues. Pure aviator oxygen which has moisture removed to prevent freezing of valves at altitude is readily available and routinely used in general aviation mountain flying and at high altitudes. Most small general aviation aircraft are not pressurized, therefore oxygen use is an FAA requirement at higher altitudes. Although pure oxygen pre-breathing is an effective method to protect against altitude DCS, it is logistically complicated and expensive for the protection of civil aviation flyers, either commercial or private. Therefore, it is currently used only by military flight crews and astronauts for protection during high-altitude and space operations. It is also used by flight test crews involved with certifying aircraft, and may also be used for high-altitude parachute jumps. Astronauts aboard the International Space Station preparing for extra-vehicular activity (EVA) "camp out" at low atmospheric pressure, 10.2 psi (0.70 bar), spending eight sleeping hours in the Quest airlock chamber before their spacewalk. During the EVA they breathe 100% oxygen in their spacesuits, which operate at 4.3 psi (0.30 bar), although research has examined the possibility of using 100% O2 at 9.5 psi (0.66 bar) in the suits to lessen the pressure reduction, and hence the risk of DCS. The recompression chamber at the Neutral Buoyancy Lab. All cases of decompression sickness should be treated initially with 100% oxygen until hyperbaric oxygen therapy (100% oxygen delivered in a high-pressure chamber) can be provided. Mild cases of the "bends" and some skin symptoms may disappear during descent from high altitude; however, it is recommended that these cases still be evaluated. Neurological symptoms, pulmonary symptoms, and mottled or marbled skin lesions should be treated with hyperbaric oxygen therapy if seen within 10 to 14 days of development. Recompression on air was shown to be an effective treatment for minor DCS symptoms by Keays in 1909. Evidence of the effectiveness of recompression therapy utilizing oxygen was first shown by Yarbrough and Behnke, and has since become the standard of care for treatment of DCS. Recompression is normally carried out in a recompression chamber. At a dive site, a riskier alternative is in-water recompression. Oxygen first aid has been used as an emergency treatment for diving injuries for years. If given within the first four hours of surfacing, it increases the success of recompression therapy as well as decreasing the number of recompression treatments required. Most fully closed-circuit rebreathers can deliver sustained high concentrations of oxygen-rich breathing gas and could be used as a means of supplying oxygen if dedicated equipment is not available. It is beneficial to give fluids, as this helps reduce dehydration. It is no longer recommended to administer aspirin, unless advised to do so by medical personnel, as analgesics may mask symptoms. People should be made comfortable and placed in the supine position (horizontal), or the recovery position if vomiting occurs. In the past, both the Trendelenburg position and the left lateral decubitus position (Durant's maneuver) have been suggested as beneficial where air emboli are suspected, but are no longer recommended for extended periods, owing to concerns regarding cerebral edema. The duration of recompression treatment depends on the severity of symptoms, the dive history, the type of recompression therapy used and the patient's response to the treatment. One of the more frequently used treatment schedules is the US Navy Table 6, which provides hyperbaric oxygen therapy with a maximum pressure equivalent to 60 feet (18 m) of seawater for a total time under pressure of 288 minutes, of which 240 minutes are on oxygen and the balance are air breaks to minimise the possibility of oxygen toxicity. A multiplace chamber is the preferred facility for treatment of decompression sickness as it allows direct physical access to the patient by medical personnel, but monoplace chambers are more widely available and should be used for treatment if a multiplace chamber is not available or transportation would cause significant delay in treatment, as the interval between onset of symptoms and recompression is important to the quality of recovery. It may be necessary to modify the optimum treatment schedule to allow use of a monoplace chamber, but this is usually better than delaying treatment. A US Navy treatment table 5 can be safely performed without air breaks if a built-in breathing system is not available. In most cases the patient can be adequately treated in a monoplace chamber at the receiving hospital. Immediate treatment with 100% oxygen, followed by recompression in a hyperbaric chamber, will in most cases result in no long-term effects. However, permanent long-term injury from DCS is possible. Three-month follow-ups on diving accidents reported to DAN in 1987 showed 14.3% of the 268 divers surveyed had ongoing symptoms of Type II DCS, and 7% from Type I DCS. Long-term follow-ups showed similar results, with 16% having permanent neurological sequelae. The incidence of decompression sickness is rare, estimated at 2.8 cases per 10,000 dives, with the risk 2.6 times greater for males than females. DCS affects approximately 1,000 U.S. scuba divers per year. In 1999, the Divers Alert Network (DAN) created "Project Dive Exploration" to collect data on dive profiles and incidents. From 1998 to 2002, they recorded 50,150 dives, from which 28 recompressions were required — although these will almost certainly contain incidents of arterial gas embolism (AGE) — a rate of about 0.05%. Around 2013, Honduras had the highest number of decompression-related deaths and disabilities in the world, caused by unsafe practices in lobster diving among the indigenous Miskito people, who face great economic pressures. At that time it was estimated that in the country over 2000 divers had been injured and 300 others had died since the 1970s. 1670: Robert Boyle demonstrated that a reduction in ambient pressure could lead to bubble formation in living tissue. This description of a bubble forming in the eye of a viper subjected to a near vacuum was the first recorded description of decompression sickness. 1769: Giovanni Morgagni described the post mortem findings of air in cerebral circulation and surmised that this was the cause of death. 1840: Charles Pasley, who was involved in the recovery of the sunken warship HMS Royal George, commented that, of those having made frequent dives, "not a man escaped the repeated attacks of rheumatism and cold". 1841: First documented case of decompression sickness, reported by a mining engineer who observed pain and muscle cramps among coal miners working in mine shafts air-pressurized to keep water out. 1854: Decompression sickness reported and one resulting death of caisson workers on the Royal Albert Bridge. 1867: Panamanian pearl divers using the revolutionary Sub Marine Explorer submersible repeatedly suffered "fever" due to rapid ascents. Continued sickness led to the vessel's abandonment in 1869. 1870: Bauer published outcomes of 25 paralyzed caisson workers. From 1870 to 1910, all prominent features were established. Explanations at the time included: cold or exhaustion causing reflex spinal cord damage; electricity cause by friction on compression; or organ congestion; and vascular stasis caused by decompression. 1871: The Eads Bridge in St Louis employed 352 compressed air workers including Alphonse Jaminet as the physician in charge. There were 30 seriously injured and 12 fatalities. Jaminet developed decompression sickness and his personal description was the first such recorded. 1872: The similarity between decompression sickness and iatrogenic air embolism as well as the relationship between inadequate decompression and decompression sickness was noted by Friedburg. He suggested that intravascular gas was released by rapid decompression and recommended: slow compression and decompression; four-hour working shifts; limit to maximum pressure of 44.1 psig (4 atm); using only healthy workers; and recompression treatment for severe cases. 1873: Andrew Smith first utilized the term "caisson disease" describing 110 cases of decompression sickness as the physician in charge during construction of the Brooklyn Bridge. The project employed 600 compressed air workers. Recompression treatment was not used. The project chief engineer Washington Roebling suffered from caisson disease, and endured the after-effects of the disease for the rest of his life. During this project, decompression sickness became known as "The Grecian Bends" or simply "the bends" because afflicted individuals characteristically bent forward at the hips: this is possibly reminiscent of a then popular women's fashion and dance maneuver known as the Grecian Bend. 1890 During construction of the Hudson River Tunnel contractor's agent Ernest William Moir pioneered the use of an airlock chamber for treatment. 1900: Leonard Hill used a frog model to prove that decompression causes bubbles and that recompression resolves them. Hill advocated linear or uniform decompression profiles. This type of decompression is used today by saturation divers. His work was financed by Augustus Siebe and the Siebe Gorman Company. 1904: Tunnel building to and from Manhattan Island caused over 3,000 injuries and over 30 deaths which led to laws requiring PSI limits and decompression rules for "sandhogs" in the United States. 1904: Seibe and Gorman in conjunction with Leonard Hill developed and produced a closed bell in which a diver can be decompressed at the surface. 1908: "The Prevention of Compressed Air Illness" was published by JS Haldane, Boycott and Damant recommending staged decompression. These tables were accepted for use by the Royal Navy. 1914–16: Experimental decompression chambers were in use on land and aboard ship. 1924: The US Navy published the first standardized recompression procedure. 1930s: Albert R Behnke separated the symptoms of Arterial Gas Embolism (AGE) from those of DCS. 1935: Behnke et al. experimented with oxygen for recompression therapy. 1937: Behnke introduced the "no-stop" decompression tables. 1941: Altitude DCS is treated with hyperbaric oxygen for the first time. 1957: Robert Workman established a new method for calculation of decompression requirements (M-values). 1959: The "SOS Decompression Meter", a submersible mechanical device that simulated nitrogen uptake and release, was introduced. 1960: FC Golding et al. split the classification of DCS into Type 1 and 2. 1982: Paul K Weathersby, Louis D Homer and Edward T Flynn introduce survival analysis into the study of decompression sickness. 1983: Orca produced the "EDGE", a personal dive computer, using a microprocessor to calculate nitrogen absorption for twelve tissue compartments. 1984: Albert A Bühlmann released his book "Decompression–Decompression Sickness," which detailed his deterministic model for calculation of decompression schedules. In the United States, it is common for medical insurance not to cover treatment for the bends that is the result of recreational diving. This is because scuba diving is considered an elective and "high-risk" activity and treatment for decompression sickness is expensive. A typical stay in a recompression chamber will easily cost several thousand dollars, even before emergency transportation is included. As a result, groups such as Divers Alert Network (DAN) offer medical insurance policies that specifically cover all aspects of treatment for decompression sickness at rates of less than $100 per year. In the United Kingdom, treatment of DCS is provided by the National Health Service. This may occur either at a specialised facility or at a hyperbaric centre based within a general hospital. Animals may also contract DCS, especially those caught in nets and rapidly brought to the surface. It has been documented in loggerhead turtles and likely in prehistoric marine animals as well. Modern reptiles are susceptible to DCS, and there is some evidence that marine mammals such as cetaceans and seals may also be affected. AW Carlsen has suggested that the presence of a right-left shunt in the reptilian heart may account for the predisposition in the same way as a patent foramen ovale does in humans. ^ Inner ear counter diffusion is a rare form of DCS sometimes experienced by divers engaged in extreme deep diving, caused by switching from a helium-rich gas to a nitrogen-rich gas at the start of a decompression stop. Although nitrogen diffuses more slowly than helium, nitrogen is much more soluble than helium and the total inert gas load in some tissues can temporarily exceed the critical supersaturation limit, resulting in bubble formation. The inner ear is particularly susceptible to this effect. Two of the best-recorded instances of it both occurred at Boesmansgat, South Africa — once to Nuno Gomes in an early world record attempt, and later to Don Shirley when he tried to rescue David Shaw on his fateful dive trying to recover the body of Deon Dreyer, who had been one of Gomes's support divers. ^ Tables based on US Navy tables, such as the NAUI tables have a safety stop at 15 feet (5 m);(Lippmann & Mitchell, p. 219) BSAC tables have a safety stop at 6 metres (20 ft); Bühlmann tables have a safety stop at 3 metres (10 ft). ^ a b Francis & Mitchell, Manifestations, p. 578. ^ a b Pulley, Stephen A (27 November 2007). "Decompression Sickness". Medscape. Retrieved 15 May 2010. ^ a b c Marx, p. 1908. ^ Francis & Mitchell, Manifestations, p. 579. ^ a b c Francis, T James R; Smith, DJ (1991). "Describing Decompression Illness". 42nd Undersea and Hyperbaric Medical Society Workshop. 79(DECO)5–15–91. Retrieved 23 May 2010. ^ Francis & Mitchell, Manifestations, p. 580. ^ U.S. Navy Supervisor of Diving (2008). "Chapter 20: Diagnosis and Treatment of Decompression Sickness and Arterial Gas Embolism". U.S. Navy Diving Manual (PDF). SS521-AG-PRO-010, revision 6. volume 5. U.S. Naval Sea Systems Command. p. 37. Archived from the original (PDF) on 5 March 2011. Retrieved 15 May 2010. ^ Francis & Mitchell, Manifestations, pp. 578–584. ^ Doolette, David J; Mitchell, Simon J (2003). "Biophysical basis for inner ear decompression sickness". Journal of Applied Physiology. 94 (6): 2145–50. doi:10.1152/japplphysiol.01090.2002. PMID 12562679. Retrieved 30 September 2014. ^ U.S. Navy Supervisor of Diving (2008). U.S. Navy Diving Manual (PDF). SS521-AG-PRO-010, revision 6. vol.5. U.S. Naval Sea Systems Command. pp. 20–25. Archived from the original (PDF) on 5 March 2011. Retrieved 18 May 2010. ^ a b c d e f g h i j Vann, Richard D, ed. (1989). "The Physiological Basis of Decompression". 38th Undersea and Hyperbaric Medical Society Workshop. 75(Phys)6–1–89: 437. Retrieved 15 May 2010. ^ Benton, BJ (2001). "Acute Decompression Illness (DCI): the Significance of Provocative Dive Profiles". Undersea and Hyperbaric Medicine Abstract. 28 (Supplement). ISSN 1066-2936. OCLC 26915585. Retrieved 18 May 2010. ^ Wong, RM (1999). "Taravana revisited: Decompression illness after breath-hold diving". South Pacific Underwater Medicine Society Journal. 29 (3). ISSN 0813-1988. OCLC 16986801. Retrieved 18 May 2010. ^ Lippmann & Mitchell, pp. 65–66. ^ Ohta, Yoshimi; Matsunaga, Hitoshi (February 1974). "Bone lesions in divers". Journal of Bone and Joint Surgery. 56B (1): 3–15. Archived from the original on 24 July 2011. Retrieved 18 May 2010. ^ Elliott, David H (1999). "Early Decompression experience: Compressed air work". South Pacific Underwater Medicine Society Journal. 29 (1). ISSN 0813-1988. OCLC 16986801. Retrieved 18 May 2010. ^ a b c d e f g h i Dehart, RL; Davis, JR (2002). Fundamentals Of Aerospace Medicine: Translating Research Into Clinical Applications (3rd Rev ed.). United States: Lippincott Williams and Wilkins. p. 720. ISBN 978-0-7817-2898-0. ^ a b c d Pilmanis, Andrew A (1990). "The Proceedings of the Hypobaric Decompression Sickness Workshop". US Air Force Technical Report. AL-SR-1992-0005. Retrieved 18 May 2010. ^ Vann, Richard D; Torre-Bueno, JR (1984). "A theoretical method for selecting space craft and space suit atmospheres". Aviation, Space, and Environmental Medicine. 55 (12): 1097–1102. ISSN 0095-6562. PMID 6151391. ^ a b c d e Butler, WP (2004). "Caisson disease during the construction of the Eads and Brooklyn Bridges: A review". Undersea and Hyperbaric Medicine. 31 (4): 445–59. PMID 15686275. Retrieved 30 May 2010. ^ a b "Hudson River Tunnel". Engineering Timelines. Retrieved 4 December 2016. ^ Gerth, Wayne A; Vann, Richard D (1995). "Statistical Bubble Dynamics Algorithms for Assessment of Altitude Decompression Sickness Incidence". US Air Force Technical Report. TR-1995-0037. Retrieved 18 May 2010. ^ Robinson, RR; Dervay, JP; Conkin, Johnny. "An Evidenced-Based Approach for Estimating Decompression Sickness Risk in Aircraft Operations" (PDF). NASA STI Report Series. NASA/TM—1999–209374. Archived from the original (PDF) on 30 October 2008. Retrieved 18 May 2010. ^ Powell, Michael R (2002). "Decompression limits in commercial aircraft cabins with forced descent". Undersea and Hyperbaric Medicine. Supplement (abstract). Retrieved 18 May 2010. ^ a b Vann, Richard D; Gerth, Wayne A; DeNoble, Petar J; Pieper, Carl F; Thalmann, Edward D (2004). "Experimental trials to assess the risks of decompression sickness in flying after diving". Undersea and Hyperbaric Medicine. 31 (4): 431–44. ISSN 1066-2936. OCLC 26915585. PMID 15686274. Retrieved 18 May 2010. ^ Brown, JR; Antuñano, Melchor J (14 July 2005). "Altitude-Induced Decompression Sickness" (PDF). AM-400-95/2. Federal Aviation Administration. Retrieved 27 June 2010. ^ Pollock, Neal W; Natoli, Michael J; Gerth, Wayne A; Thalmann, Edward D; Vann, Richard D (November 2003). "Risk of decompression sickness during exposure to high cabin altitude after diving". Aviation, Space, and Environmental Medicine. 74 (11): 1163–68. PMID 14620473. Retrieved 18 May 2010. ^ DeNoble, PJ; Vann, RD; Pollock, NW; Uguccioni, DM; Freiberger, JJ; Pieper, CF (2005). "A case-control study of decompression sickness (DCS) and arterial gas embolism (AGE)". Undersea and Hyperbaric Medical Society. Retrieved 29 February 2016. ^ a b c d e f g h Fryer, DI (1969). Subatmospheric decompression sickness in man. England: Technivision Services. p. 343. ISBN 978-0-85102-023-5. ^ Lippmann & Mitchell, p. 232. ^ a b Bassett, Bruce E (1982). "Decompression Procedures for Flying After Diving, and Diving at Altitudes above Sea Level". US Air Force School of Aerospace Medicine Technical Report. SAM-TR-82-47. Retrieved 18 May 2010. ^ Sheffield, Paul J; Vann, Richard D (2002). Flying After Diving Workshop. Proceedings of the DAN 2002 Workshop. United States: Divers Alert Network. p. 127. ISBN 978-0-9673066-4-3. Retrieved 18 May 2010. ^ Vann, Richard D; Pollock, Neal W; Freiberger, John J; Natoli, Michael J; Denoble, Petar J; Pieper, Carl F (2007). "Influence of bottom time on preflight surface intervals before flying after diving". Undersea and Hyperbaric Medicine. 34 (3): 211–20. PMID 17672177. Retrieved 18 May 2010. ^ Lippmann & Mitchell, p. 79. ^ Egi, SM; Brubakk, Alf O (1995). "Diving at altitude: a review of decompression strategies". Undersea and Hyperbaric Medicine. 22 (3): 281–300. ISSN 1066-2936. OCLC 26915585. PMID 7580768. Retrieved 18 May 2010. ^ Walder, Dennis N (1945). "The Surface Tension of the Blood Serum in 'Bends'". Royal Air Force Technical Report. ^ Lippmann & Mitchell, p. 71. ^ Moon, Richard E; Kisslo, Joseph (1998). "PFO and decompression illness: An update". South Pacific Underwater Medicine Society Journal. 28 (3). ISSN 0813-1988. OCLC 16986801. Retrieved 18 May 2010. ^ Lippmann & Mitchell, p. 70. ^ Karlsson, L; Linnarson, D; Gennser, M; Blogg, SL; Lindholm, Peter (2007). "A case of high doppler scores during altitude decompression in a subject with a fractured arm". Undersea and Hyperbaric Medicine. 34 (Supplement). ISSN 1066-2936. OCLC 26915585. Retrieved 18 May 2010. ^ Gerth, Wayne A; Ruterbusch, VL; Long, Edward T (2007). "The Influence of Thermal Exposure on Diver Susceptibility to Decompression Sickness". United States Navy Experimental Diving Unit Technical Report. NEDU-TR-06-07. Retrieved 18 May 2010. ^ Boycott, AE; Damant, JCC (1908). "Experiments on the influence of fatness on susceptibility to caisson disease". Journal of Hygiene. 8 (4): 445–56. doi:10.1017/S0022172400015862. PMC 2167151. PMID 20474366. ^ Leigh, BC; Dunford, Richard G (2005). "Alcohol use in scuba divers treated for diving injuries: A comparison of decompression sickness and arterial gas embolism" (PDF). Alcoholism: Clinical and Experimental Research. 29 (Supplement&nbsp, s1): 157A. doi:10.1111/j.1530-0277.2005.tb03524.x. Archived from the original (PDF) on 5 December 2013. Presented at the Annual Meeting of the Research Society on Alcoholism, Santa Barbara, California, June 2005. ^ Ackles, KN (1973). "Blood-Bubble Interaction in Decompression Sickness". Defence R&D Canada (DRDC) Technical Report. DCIEM-73-CP-960. Retrieved 23 May 2010. ^ Nishi Brubakk & Eftedal, p. 501. ^ Kindwall, Eric P; Baz, A; Lightfoot, EN; Lanphier, Edward H; Seireg, A (1975). "Nitrogen elimination in man during decompression". Undersea Biomedical Research. 2 (4): 285–297. ISSN 0093-5387. OCLC 2068005. PMID 1226586. Retrieved 23 May 2010. ^ Kindwall, Eric P (1975). "Measurement of helium elimination from man during decompression breathing air or oxygen". Undersea Biomedical Research. 2 (4): 277–284. ISSN 0093-5387. OCLC 2068005. PMID 1226585. Retrieved 23 May 2010. ^ Francis & Mitchell, Manifestations, pp. 583–584. ^ Francis & Mitchell, Pathophysiology, pp. 530–541. ^ Landis, Geoffrey A (19 March 2009). "Explosive Decompression and Vacuum Exposure". Archived from the original on 21 July 2009. Retrieved 30 July 2010. ^ Hamilton & Thalmann, p. 475. ^ Wienke, Bruce R; O'Leary, Timothy R (10 October 2002). "Deep stops and deep helium" (PDF). RGBM Technical Series 9. Tampa, Florida: NAUI Technical Diving Operations. Retrieved 27 June 2010. ^ Fife, William P (1979). "The use of Non-Explosive mixtures of hydrogen and oxygen for diving". Texas A&M University Sea Grant. TAMU-SG-79-201. ^ Brauer, RW, ed. (1985). "Hydrogen as a Diving Gas". 33rd Undersea and Hyperbaric Medical Society Workshop (UHMS Publication Number 69(WS–HYD)3–1–87). Retrieved 23 May 2010. ^ Hamilton & Thalmann, p. 477. ^ Burton, Steve (December 2004). "Isobaric Counter Diffusion". ScubaEngineer. Retrieved 10 January 2010. ^ a b c d Papadopoulou, Virginie; Eckersley, Robert J; Balestra, Costantino; Karapantsios, Thodoris D; Tang, Meng-Xing (2013). "A critical review of physiological bubble formation in hyperbaric decompression". Advances in Colloid and Interface Science. 191–192 (191–192): 22–30. doi:10.1016/j.cis.2013.02.002. hdl:10044/1/31585. PMID 23523006. ^ a b c d Calder 1986, pp. 241-245. ^ a b c Vann, R.D., ed. (1989). The Physiological basis of decompression: an overview. Proceedings of the thirty-eighth undersea and hyperbaric medical society workshop. Bethesda, Maryland: Undersea and Hyperbaric Medical Society. pp. 1–10. ^ Moon, Richard E; Kisslo, Joseph (1998). "PFO and decompression illness: An update". South Pacific Underwater Medicine Society Journal. 28 (3). ISSN 0813-1988. OCLC 16986801. Retrieved 31 October 2011. ^ a b Stephenson, Jeffrey (2016). "Pathophysiology, treatment and aeromedical retrieval of SCUBA – related DCI". Journal of Military and Veterans' Health. 17 (3). ISSN 1839-2733. ^ Staff (May 2014). "Pathophysiology". Medscape Drugs & Diseases. Medscape. pp. Organ involvement associated with decompression sickness. Retrieved 8 March 2016. ^ Kitano, Motoo (1995). "Pathological Aspects of Decompression Sickness". 南太平洋海域調査研究報告=Occasional papers, Volume 25. 鹿児島大学: 47–59. hdl:10232/16803. ^ a b c d e Calder 1986, pp. 246-254. ^ Calder 1986, pp. 254-258. ^ a b c Thalmann, Edward D (March – April 2004). "Decompression Illness: What Is It and What Is The Treatment?". Divers Alert Network. Archived from the original on 13 June 2010. Retrieved 3 August 2010. ^ Divers Alert Network (1997). "Report on Diving Accidents and Fatalities in 1995". Divers Alert Network. Retrieved 23 May 2010. ^ a b Moon, Richard E (1998). "Assessment of patients with decompression illness". South Pacific Underwater Medicine Society Journal. 28 (1). Retrieved 23 May 2010. ^ Moon, Richard E; Sheffield, Paul J, eds. (1996). "Treatment of Decompression Illness. 45th Undersea and Hyperbaric Medical Society Workshop". UHMS Publication Number WD712: 426. Retrieved 25 May 2010. ^ a b Hamilton & Thalmann, p. 471. ^ Hamilton & Thalmann, p. 455. ^ Hamilton & Thalmann, pp. 456–457. ^ Hamilton & Thalmann, pp. 471–473. ^ Hamilton & Thalmann, pp. 474–475. ^ Hamilton & Thalmann, p. 456. ^ Nevills, Amiko (2006). "Preflight Interview: Joe Tanner". NASA. Retrieved 26 June 2010. ^ Webb, James T; Olson, RM; Krutz, RW; Dixon, G; Barnicott, PT (1989). "Human tolerance to 100% oxygen at 9.5 psia during five daily simulated 8-hour EVA exposures". Aviation, Space, and Environmental Medicine. 60 (5): 415–21. doi:10.4271/881071. PMID 2730484. ^ Keays, FJ (1909). "Compressed air illness, with a report of 3,692 cases". Department of Medicine Publications of Cornell University Medical College. 2: 1–55. ^ Yarbrough, OD; Behnke, Albert R (1939). "The treatment of compressed air illness using oxygen". Journal of Industrial Hygiene and Toxicology. 21: 213–18. ISSN 0095-9030. ^ Berghage, Thomas E; Vorosmarti Jr, James; Barnard, EEP (1978). "Recompression treatment tables used throughout the world by government and industry". US Naval Medical Research Center Technical Report. NMRI-78-16. Retrieved 25 May 2010. ^ Edmonds, Carl (1998). "Underwater oxygen for treatment of decompression sickness: A review". South Pacific Underwater Medicine Society Journal. 25 (3). ISSN 0813-1988. OCLC 16986801. Retrieved 5 April 2008. ^ Pyle, Richard L; Youngblood, David A (1995). "In-water Recompression as an emergency field treatment of decompression illness". AquaCorp. 11. Retrieved 25 May 2010. ^ Kay, Edmond; Spencer, Merrill P (1999). In water recompression. 48th Undersea and Hyperbaric Medical Society Workshop. United States: Undersea and Hyperbaric Medical Society. p. 108. Retrieved 25 May 2010. ^ a b Moon & Gorman, p. 616. ^ Longphre, John M; DeNoble, Petar J; Moon, Richard E; Vann, Richard D; Freiberger, John J (2007). "First aid normobaric oxygen for the treatment of recreational diving injuries". Undersea and Hyperbaric Medicine. 34 (1): 43–49. ISSN 1066-2936. OCLC 26915585. PMID 17393938. Retrieved 25 May 2010. ^ Goble, Steve (2003). "Rebreathers". Journal of the South Pacific Underwater Medicine Society. 33 (2): 98–102. Retrieved 25 July 2010. ^ O'Dowd, Liza C; Kelley, Mark A (October 2000). "Air embolism". Chinese Medical Biotechnology Information Network. Peking University. Archived from the original on 17 July 2011. Retrieved 8 August 2010. ^ Bove, Alfred A (April 2009). "Arterial Gas Embolism: Injury During Diving or Work in Compressed Air". Merck Manual Professional. Merk Sharp and Dohme. Retrieved 8 August 2010. ^ U.S. Navy Supervisor of Diving (2008). "Chapter 20: Diagnosis and Treatment of Decompression Sickness and Arterial Gas Embolism". U.S. Navy Diving Manual (PDF). SS521-AG-PRO-010, revision 6. volume 5. U.S. Naval Sea Systems Command. p. 41. Archived from the original (PDF) on 5 March 2011. Retrieved 15 May 2010. ^ a b c Kindwall, EP; Goldmann, RW; Thombs, PA (1988). "Use of the Monoplace vs. Multiplace Chamber in the Treatment of Diving Diseases". Journal of Hyperbaric Medicine; 3(1). Undersea and Hyperbaric Medical Society, Inc. pp. 5–10. Retrieved 25 February 2016. ^ Bennett, Peter B; Dovenbarger, Joel A; Corson, Karen (1991). Nashimoto, I; Lanphier, EH (eds.). "Epidemiology of Bends - What is Bends?". 43rd Undersea and Hyperbaric Medical Society Workshop. 80(BENDS)6–1–91: 13–20. Retrieved 30 May 2010. ^ Dovenbarger, Joel A (1988). "Report on Decompression Illness and Diving Fatalities (1988)". Divers Alert Network. Retrieved 30 May 2010. ^ Desola, J (1989). "Epidemiological review of 276 dysbaric diving accidents". Proceedings XV Meeting European Undersea Biomedical Society: 209. ^ "Project Dive Exploration: Project Overview". Divers Alert Network. 2010. Archived from the original on 13 June 2010. Retrieved 30 May 2010. ^ a b Best, Barbara (September – October 2013). "Lobsters, Reefs and Livelihoods". FrontLines. U.S. Agency for International Development. Retrieved 22 April 2018. ^ Acott, Chris (1999). "The diving "Law-ers": A brief resume of their lives". South Pacific Underwater Medicine Society Journal. 29 (1). ISSN 0813-1988. OCLC 16986801. Retrieved 30 May 2010. ^ a b c d e f g h i j Acott, Chris (1999). "A brief history of diving and decompression illness". South Pacific Underwater Medicine Society Journal. 29 (2). ISSN 0813-1988. OCLC 16986801. Retrieved 30 May 2010. ^ Buxton-Smith, Thomas R (27 April 2007). "Brunel's Royal Albert Bridge, The Tamar Rail River Crossing" (PDF). Proceedings of Bridge Engineering 2 Conference 2007. University of Bath. Retrieved 15 December 2017. ^ Delgado, James (2012). "Misadventures of a Civil War Submarine: Iron, Guns, and Pearls". Texas A&M University Press: 100. ^ Smith, Andrew Heermance (1886). The Physiological, Pathological and Therapeutical Effects of Compressed Air. George S. Davis. Retrieved 30 May 2010. ^ McCullough, David (June 2001). The Great Bridge: The Epic Story of the Building of the Brooklyn Bridge. Simon & Schuster. ISBN 978-0-7432-1737-8. Retrieved 30 September 2014. ^ a b Hill, Leonard Erskine (1912). Caisson sickness, and the physiology of work in compressed air. London: Arnold. ISBN 978-1-113-96529-5. Retrieved 30 May 2010. ^ Phillips, John L (1998). The bends : compressed air in the history of science, diving, and engineering. New Haven, CT: Yale University Press. pp. 95–97. ISBN 978-0300071252. ^ Staff (25 July 1904). "Ocean Treasure". Daily News. Daily News, Perth, WA. p. 6. Retrieved 1 March 2015. ^ Boycott, AE; Damant, GCC; Haldane, John Scott (1908). "Prevention of compressed air illness". Journal of Hygiene. 8 (3): 342–443. doi:10.1017/S0022172400003399. PMC 2167126. PMID 20474365. Retrieved 30 May 2010. ^ Jones, Natalie (28 February 2015). "Pearling industry marks 100 years of treating the bends". ABC News. Retrieved 1 March 2015. ^ Scott, David (1931). Seventy fathoms deep with the divers of the salvage ship Artiglio. London: Faber & Faber. ^ Scott, David (1932). The Egypt's Gold. London: Faber & Faber. ^ a b Thalmann, Edward D (1990). Bennett, Peter B; Moon, Richard E (eds.). "Principles of U.S Navy recompression treatments for decompression sickness - Diving Accident Management". 41st Undersea and Hyperbaric Medical Society Workshop. 78(DIVACC)12–1–90. Retrieved 30 May 2010. ^ Behnke, Albert R; Shaw, Louis A; Messer, Anne C; Thomson, Robert M; Motley, E Preble (31 January 1936). "The circulatory and respiratory disturbances of acute compressed-air illness and the administration of oxygen as a therapeutic measure". American Journal of Physiology. 114 (3): 526–533. doi:10.1152/ajplegacy.1936.114.3.526. Retrieved 30 May 2010. ^ Workman, Robert D (1957). "Calculation of air saturation decompression tables". Navy Experimental Diving Unit Technical Report. NEDU-RR-11-57. Retrieved 30 May 2010. ^ a b Carson, Daryl. "Dive Computer Evolution". Skin-Diver.com. Archived from the original on 28 July 2011. Retrieved 30 May 2010. ^ Golding, F Campbell; Griffiths, P; Hempleman, HV; Paton, WDM; Walder, DN (July 1960). "Decompression sickness during construction of the Dartford Tunnel". British Journal of Industrial Medicine. 17 (3): 167–80. doi:10.1136/oem.17.3.167. PMC 1038052. PMID 13850667. ^ Weathersby, Paul K; Homer, Louis D; Flynn, Edward T (September 1984). "On the likelihood of decompression sickness". Journal of Applied Physiology. 57 (3): 815–25. doi:10.1152/jappl.1984.57.3.815. PMID 6490468. Retrieved 27 April 2009. ^ Bühlmann, Albert A (1984). Decompression–Decompression Sickness. Berlin New York: Springer-Verlag. ISBN 978-0-387-13308-9. ^ "DAN Insurance". Divers Alert Network. 2003. Archived from the original on 26 July 2010. Retrieved 25 July 2010. ^ "NHS Funded Treatment". London Hyperbaric Ltd. Archived from the original on 21 July 2011. Retrieved 22 August 2011. ^ Wilson, Colin M; Sayer, Martin DJ (2011). "Transportation of divers with decompression illness on the west coast of Scotland". Diving and Hyperbaric Medicine. 41 (2): 64–9. PMID 21848109. ^ Gabbitiss, Josh (4 October 2017). "Even Sea Monsters Got the Bends". Hakai magazine. Retrieved 6 October 2017. ^ a b Carlsen, Agnete Weinreich (August 2017). "Frequency of decompression illness among recent and extinct mammals and "reptiles": a review". The Science of Nature. 104 (7–8): 56. doi:10.1007/s00114-017-1477-1. PMID 28656350. ^ Piantadosi, CA; Thalmann, E. D. (15 April 2004). "Pathology: whales, sonar and decompression sickness". Nature. 428 (6984): 716. doi:10.1038/nature02527a. PMID 15085881. ^ "Why Do Whales Get the Bends?". www.sciencemag.org. American Association for the Advancement of Science. 14 December 2007. Retrieved 9 October 2017. ^ Becker, Rachel A. (19 August 2015). "Do Whales Get the Bends?". news.nationalgeographic.com. National Geographic Society. Retrieved 9 October 2017. Calder, Ian M. (1986). "Dysbarism. A Review". Forensic Science International. 30 (4): 237–266. doi:10.1016/0379-0738(86)90133-7. Francis, T James R; Mitchell, Simon J (2003). "10.4: Pathophysiology of Decompression Sickness". In Brubakk, Alf O.; Neuman, Tom S. (eds.). Bennett and Elliott's physiology and medicine of diving (5th Revised ed.). United States: Saunders. pp. 530–556. ISBN 978-0-7020-2571-6. OCLC 51607923. Francis, T James R; Mitchell, Simon J (2003). "10.6: Manifestations of Decompression Disorders". In Brubakk, Alf O; Neuman, Tom S (eds.). Bennett and Elliott's physiology and medicine of diving (5th Revised ed.). United States: Saunders. pp. 578–599. ISBN 978-0-7020-2571-6. OCLC 51607923. Hamilton, Robert W; Thalmann, Edward D (2003). "10.2: Decompression Practice". In Brubakk, Alf O; Neuman, Tom S (eds.). Bennett and Elliott's physiology and medicine of diving (5th Revised ed.). United States: Saunders. pp. 455–500. ISBN 978-0-7020-2571-6. OCLC 51607923. Lippmann, John; Mitchell, Simon (2005). Deeper into Diving (2nd ed.). Melbourne, Australia: J L Publications. ISBN 978-0-9752290-1-9. Marx, John (2010). Rosen's emergency medicine: concepts and clinical practice (7th ed.). Philadelphia, PA: Mosby/Elsevier. ISBN 978-0-323-05472-0. Moon, Richard E; Gorman, Des F (2003). "10.7: Treatment of the Decompression Disorders". In Brubakk, Alf O; Neuman, Tom S (eds.). Bennett and Elliott's physiology and medicine of diving (5th Revised ed.). United States: Saunders. pp. 600–650. ISBN 978-0-7020-2571-6. OCLC 51607923. Nishi, Ron Y; Brubakk, Alf O; Eftedal, Olav S (2003). "10.3: Bubble Detection". In Brubakk, Alf O; Neuman, Tom S (eds.). Bennett and Elliott's physiology and medicine of diving (5th Revised ed.). United States: Saunders. p. 501. ISBN 978-0-7020-2571-6. OCLC 51607923. Powell, Mark (2008). Deco for Divers. Southend-on-Sea: Aquapress. ISBN 978-1-905492-07-7. 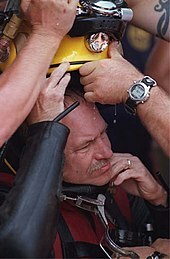 Look up decompression sickness in Wiktionary, the free dictionary. This page was last edited on 19 March 2019, at 04:30 (UTC).